With e-learning being a close cousin to so many related fields—web design, software development, technical writing, and multimedia design to name just a few!—it’s no wonder the language of e-learning encompasses a stunning assortment of scientific and academic concepts, project management lingo, technical jargon, and graphic design terms. Who has the time to sort out what they all mean? That’s why I created the following handy slider interaction in Articulate Storyline 2. 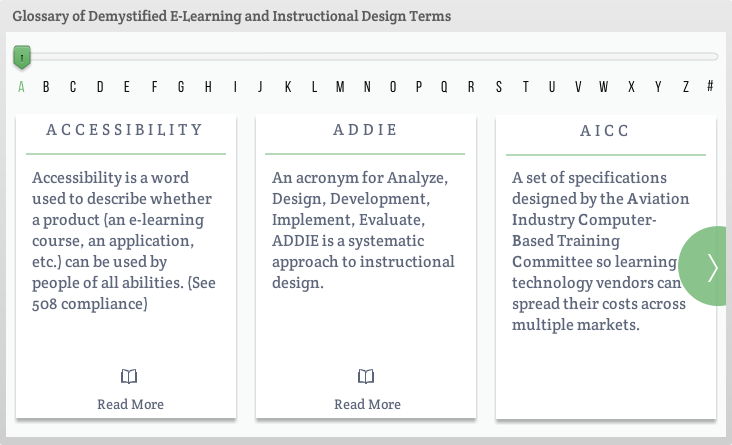 I culled through dozens of articles on E-Learning Heroes to locate the most plainspoken, succinct definitions of many common e-learning and instructional design terms. I’ve also linked many of the explanations to additional reading, e-learning examples, and free downloads to help deepen your understanding and show many of the concepts in action. In short, this little slider interaction is one part e-learning example and one part instructional design and e-learning glossary. Disclaimer: while fairly comprehensive, this glossary doesn’t include every single e-learning or instructional design term in use. Also, I’ve purposely kept all of the definitions pretty high level—hence the use of links to additional reading and examples. Whether you “slide” through the glossary as a quick refresher or bookmark it and use it as a handy reference tool, I hope this example is useful for helping you build your e-learning cred. New to e-learning and instructional design? What terms or concepts are tripping you up? Share your stories or lessons learned with a comment below. This is great Trina ! Thank you ! I was looking for the idea how to make an interactive glossary. Is it possible to share the template ?